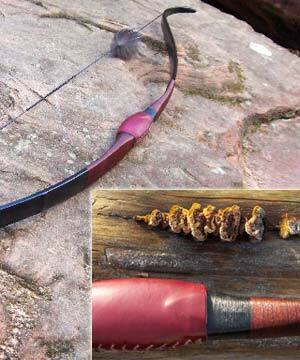 Have you made a bow using one of Dean's BBO Blanks? Have you made a BBO using Dean's HBB video? If so, send us your pictures and a brief paragraph or two offering perspective on your experiences, and we'll post them in our gallery! Pictures should be clear, showing as much detail as possible including closeups of detailed finish work and at full draw. Photos should be in jpeg format, 72dpi and not exceed 640 x 480 pixels in actual size. Paragraphs are not solicited as an endorsement of the Bowyer's Edge, but rather should offer a testimonial of your accomplishments. The slats for the bows' bellies were sawed out of a black locust board from the sawmill. The arrangement of the annual rings within that slat is vertical. The slats were spliced together with resorcin resin glue. Wood was dried down to 8%; the bamboo's moisture content was brought to an even lower level. The bamboo backing and the tip overlays were glued with epoxy. Urac 185 is not available in Germany. There are only 3 nodes to be found on each bamboo back, thanks to the space between nodes being a respectable 24 inches (60cm). Thus the middle node is positioned exactly in the handle's center. 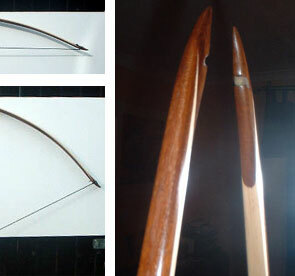 The riser piece of the reflex bow is out of pear wood, and the reflex-deflex bow's out of cherry wood. 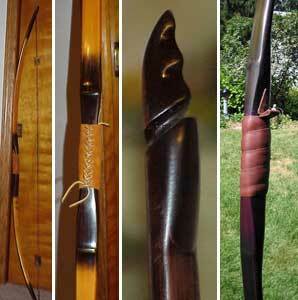 Bows' finish is a special wood-oil and wax. Strings consist of Dacron B-50. 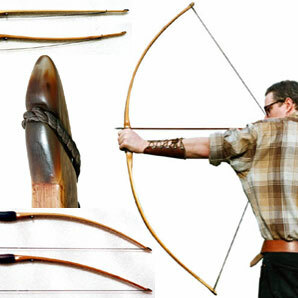 The bows were built exactly as described in the video. 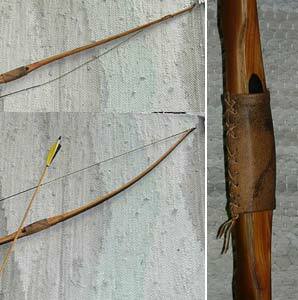 Tillering was carried out according to the facet method described in the book, Hunting the Osage Bow, in the pamphlet, "Tillering the Bamboo/Osage Blank" and in the website article "Seeing Bows Bend". Tools for tillering were the Bowyer's Ege (wouldn't do without one), a fine rasp, and a cabinet scraper. 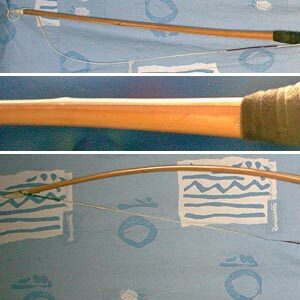 I have just completed a Hickory backed Ipe bellied English longbow. My main tool for tillering the bow was the Bowyer's Edge tool. Worked really well on such a hard timber as Ipe. After cutting the belly and back slats and rough shaping them on the bandsaw I glued them up in a little reflex on a jig such as Dean shows. 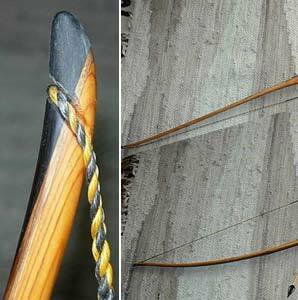 The bow was shaped to final taper using a farriers rasp, which worked suprisingly well on such a tough wood. From then on it was a large file and the Bowyer's Edge tool to put the facets into the wood, adjust taper, and slowly tiller the bow. Bow has finished up at 71 inches between the Ipe overlay nocks. 15/16ths wide at the handle tapering to 3/8ths at the nocks. Pulls 50lb at 28 inches. BE tool was perfect for the very fine tillering work needed with such a dense timber. Here are a couple more BBO's that I have made. 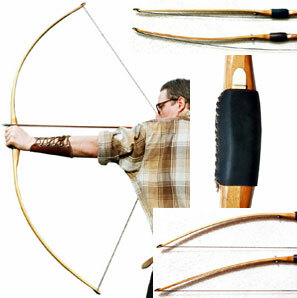 The tangerine and black bow, "Focal Point" is a straight reflex bow made from bamboo gifted to me from Dean and osage gifted to me from another bowyer known to sometimes have trouble staying focused. It features unique horn overlays. At 60#@27" this bow has very good cast and hits hard. 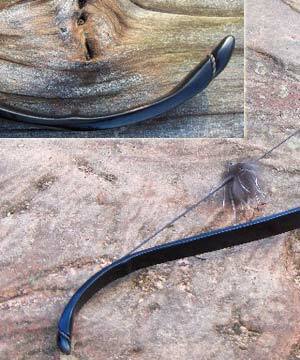 The other bow, "Nightmare" is dyed a very dark purple and is a reflex/deflex BBO with an additional full length lamination of walnut. It has nice smooth horn overlays and I thought I'd try wrapping the handle this time. 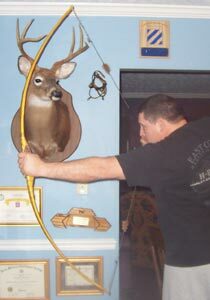 It came in at 52#@27" and shoots very smooth and you'd think the arrow was coming out of a 60# bow. The limb tips are still 1" forward of the handle after being shot in. The neat thing about this dye job is the purple will change to an iridescent green on the bamboo in the sunlight. There are a couple more bows in the works also! 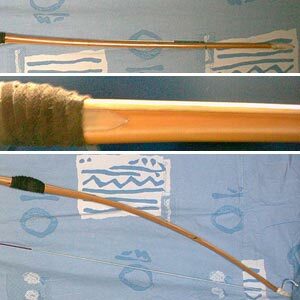 This is my first bamboo-backed bow. I have made several osage orange bows, but never made any kind of laminate. This bow pulls 42 lb. @ 27. 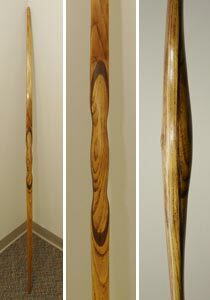 It is bamboo, osage with a black walnut and osage riser. 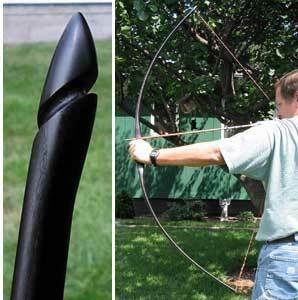 It shoots a really flat arrow. It has to be the smoothest shooting bow I have ever owned and I just love the way it feels in my hand. There is no hand shock and no stacking. Much better even than a fiberglass recurve. Thanks, Dean, for a great video! You suggest synchronizing the limbs by tracing limb profiles onto butcher paper in your HBBO tillering sheet and in the 'Seeing Bows Bend' article on your website. 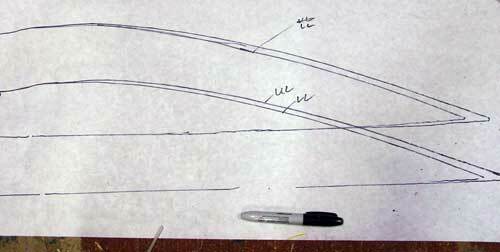 This is a photo of my limb profiles from a BBO before and after some tweaking of bend near the handle and the tips. Thanks Dean; your trick with the butcher paper tracing and using the straight stick to better see bend in hard-to-see bend places has helped tremendously. This particular bow was too heavy and still wasn't shooting arrows like I felt it should; so went back and reviewed everything, did a little bit of weight reduction and finer tillering with the bowyers edge, scraper and walkie-talkie. Then checked for bend near the handle, and there wasn't much if any at the dips and 6 inches of both tips; removed quite a bit of wood to get it to bend some there, checked limb balance with paper and shot the bow with broadhead tipped hunting arrows. Big difference in cast of the arrows, bringing the bow to tune with the heavy arrows and really didn't lose much weight, certainly no more than I needed to lose anyway. Got a few more that are going to get a working over this winter. 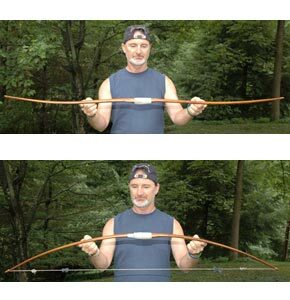 Attached are photos of a 50-inch bamboo-backed bow I made for hunting from the ground. It pulls about 50 pounds at 26 inches. I reduced the deflex by an inch in each limb from the specs in your video. I also shortened and thinned the handle section to get more working limb. I plan to hunt mainly from the ground this season, so I needed a bow I could shoot while sitting. Elinor. 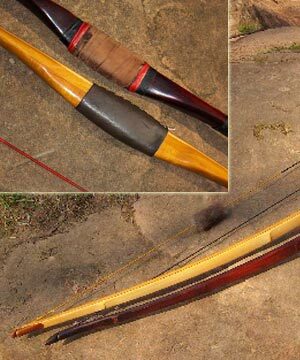 Yew/bamboo bow, 71"nock--nock; back 1 3/16" at arrow plate, 1/2" at nocks. Bamboo thickness 3/16+" at handle< 1/8" at nocks. Draw weight 49# at 28". Top nock and arrow plate Charolais steer horn. Bottom nock deer antler. Glue 2-component, slow hardening epoxy. Yew was twisted and bent, air dried two years and then placed in a warming cupboard for two more years where it was gently corrected. 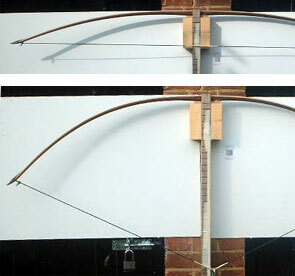 The first Bamboo-Backed Bow built by Heike from Bavaria for her husband Wolfgang. 66" / 50 lbs The nocks are from burl wood. 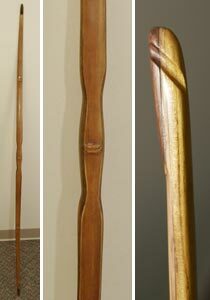 Last year I purchased a bamboo-backed osage stave from Dean along with the BBO video and a bowyer's edge. 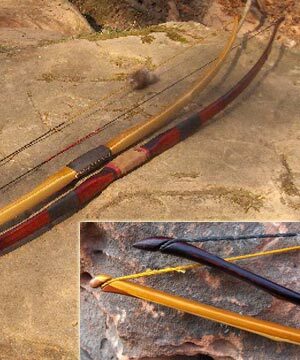 It was only my third bow to make  the two before that were hickory selfbows - and I was scared of ruining it. But I had decided to try since I knew it would be a great lesson for my patience. The tillering pamphlet as well as the b.e. instructions I found sort of hard to read for the many technical terms in it, so I decided to translate both first and these translations are now available from Dean. While I made the translations as well as when I finally made the bow, a lot of e-mails were send back and forth and Dean's answers to my questions had been of great value for me. The bow came out GREAT with about 52 pounds at a 29 inch pull. 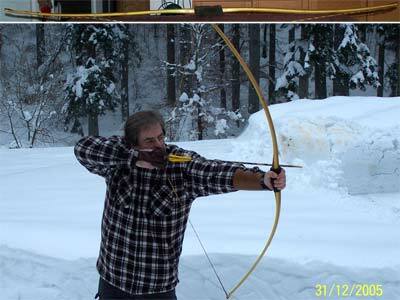 The reflexed stave turned out to be a perfectly straight bow when unbraced. I right away made another bow from bamboo-backed hickory that came out way to light for me due to tillering problems caused by only two nodes on the upper limb but three on the lower, but the lady who now shoots it is very happy with it. 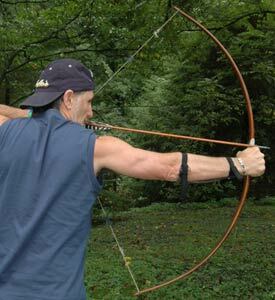 The bow has 32# at 28“ and shoots nice since I was able to keep two inches of reflex when I made it. 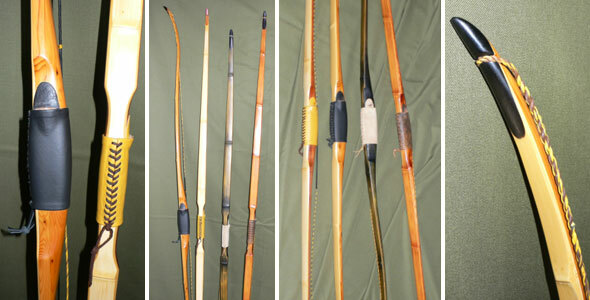 By now I have made about another ten bows of various kinds, selfbows from ash and elm following the HOB instructions, one double-recurve with bamboo on both back and belly and with the help of my new friend german bowyer Chris Glauben I made a very nice recurve with deflex handle following the method of facet tillering that came out with 58# at 29“. This one as well as the BBO and the BBH can be seen on the pictures that were taken at the Cat Stones, a celtic holy ground near were I live in Germany. Enjoy!